A Potion Shelf filled with several potions. 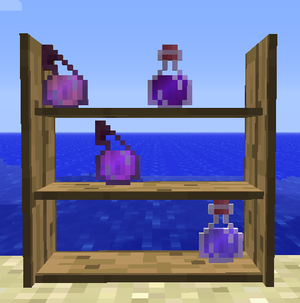 The Potion Shelf allows to display potions. When right-clicked, it presents the user with an interface showing the potions which are currently stored on the shelf, as well as the inventory. The shelf will store both regular and splash potions. Potions may be placed directly on the shelf by holding the potion in your hand and right-clicking the shelf. Similarly, you may remove potions directly from the shelf by shift-right-clicking on a potion with an empty hand. Whichever vanilla wood planks you use to craft it, it will have the matching color. Wood types cannot be mixed. Note: The Potion Shelf will also accept Thaumcraft 3 Phials of Essentia, RedPower 2 Canvas Bags and MineChem Test Tubes if those mods are installed. This page was last modified on 14 July 2018, at 13:33.